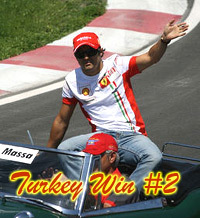 Felipe Massa did everything in Turkey except take the fast race lap, which fell to his teammate Kimi Raikkonen. In the dying seconds of qualifying Massa took pole position away from Lewis Hamilton, setting the stage for an almost clean sweep weekend in Turkey, the site of his first ever pole position and win in 2006. With Massa on pole, Raikkonen starting right behind him in 3rd, and with the McLarens on the dirty side of the grid, Hamilton in 2nd and Alonso in 4th, there really was no contest at the start as the Ferrari’s just drove away off the start and were never headed again. Raikkonen did close up on Massa late in the race, but never really threatened him at all. Hamilton settled into a solid third ahead of his teammate Alonso, and just as it looked like they would finish that way, Hamilton had a front tire failure, managed to save himself from hitting anything, but had to pit to replace the tire, dropping him back to 5th behind Alonso in 3rd and Nick Heidfeld who finished a solid 4th. Hamilton almost dropped another position back to 6th as a charging Heikki Kovalainen closed the gap to him in the closing laps as Hamilton struggled with a damaged front wing, but Kovalainen ran out of time and finished 1 second behind Hamilton in 6th. Off track this weekend things were much quieter than they have been recently, with a team meeting earlier in the week giving Alonso and Hamilton a chance to clear the air after the antics of the Hungarian Grand Prix a few weeks ago. It seems the meeting did have an effect as both Hamilton and Alonso reported that a truce had been struck. Despite this though, apparently the McLaren team was careful to make sure their drivers were never together when facing the media all weekend. Maybe everything is still not perfect in McLaren land.